Find hotel near German Occupation Memoria ..
Amidst a lot of controversy, the German Occupation Memorial was finally erected. The Hungarians did not agree with the building of this memorial and hence it came up just as it was least expected. Located at Liberty Square, this place is a disheartening reminder of the ordeal that Hungarians had to go through during the German invasion. About 2/3rd of the Hungarian population- the Jewish population was wiped out during this invasion and about 1 million Hungarians lost their lives to the hands of the Germans. You can visit the memorial any time of the day. How popular is German Occupation Memorial? People normally club together St Stephens Basilica and Budapest Operetta Theatre while planning their visit to German Occupation Memorial. Absolutely unacceptable way to white wash Hungarian participation in the killing of thousands upon thousands of Hungarian Jews during WWII. In front of this monument is a Civilian Protest Against Monument Falsifying History and it is tastefully, thoughtfully done. The descendants of Hungarian Jews sent to death by their own have left tokens, artifacts, personal items and the stories of their loved ones to show how Hungary participated in the heinous acts of WWII. If you visit, read their stories. See their faces. Remember them. Hungary was not innocent. Memorial and fountain, it is really nice to talk a walk around the area, beautiful park, watching the fountain and the people playing around it during the summer days. Pathetic attempt to falsify history. It's pathetic, funny, and ridiculous simultaneously to realize that even the so-called artist who created this disgraceful object was confused and had no idea what he's doing. 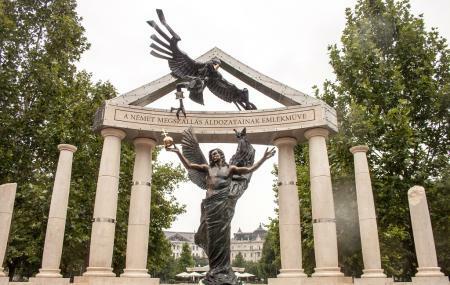 An archangel, a turul (a hawk-like mythological bird), and a crown without any apparent connection/correlation .... Monument of shame of Hungary. Hitler occupied Hungary without a gunshot... it's a kitchy statue which tries to change history. I feel ashamed. It shouldn't have been made.